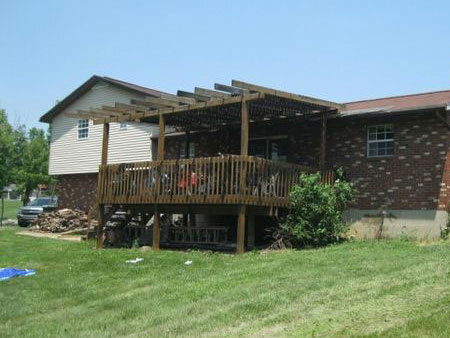 Nice 7 Room, 3 Bedroom, 2 Bath Home * 5.411 Acres $45,000 Minimum Bid !!! 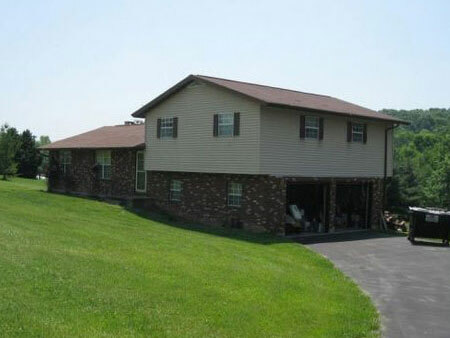 This 7 room, 3 bedroom, 2 bath home as an attached 2 car garage with asphalt driveway. The approx. 5 acres has a beautiful White Pine/hardwood lot with stream; garden space. The home is equipped with central air by heat pump; 200 amp breaker box; co. water, cistern, septic system. Main level home consists of kitchen w/top & bottom cabinetry; stainless steel sink, adjoining raised deck viewing the valley & hills below. Formal dining & living rooms. The second level consists of 3 bedrooms, 2 full baths with one attached to a bedroom. Cub Cadet riding mower, Model 3235 series 3000, 64” deck equipped w/Kohler Command 23 motor; Mower accessories: pull behind dethatched; single axel pull behind yard cart; 20” cut B&S motor 3.5 HP push mower; Chainsaws: STIHL Model 210 w/case; Poulan Model 220 Pro; CRAFTSMAN 33cc weed eater (NICE) 18V POWERTANK battery operated; TORO electric leaf blower; 14.4 V CRAFTSMAN combo kit circular saw & drill; 2.25 Ton CRAFTSMAN floor jack; hand tools, drill bits & misc. hardware. NICE Ethan Allen dbl ped. Dbl end slide out dining room table, 2 leaves in Walnut 1 bench, 2 Arrow back Ethan Allen arm chairs; Ethan Allen 2 door 3 drawer dresser w/mirror; pr of end tables; glass top end table; coffee table; 6 matching Maple dining chairs; 4 shelf open bookcase; NICE 3 cushion hide-a-bed sofa; GORHAM sterling silver set approx. 41 pcs; antique butter churn; FENTON stemmed cake plate; WESTMORELAND stemmed laced cake pedestal; STEIFF candle snuffer; assorted silverware; KITCHENAID stationary mixer; SUNMAID Mixmaster; FRIGIDAIRE side-by side refrig; ANSONIA 8 day mantle clock; tobacco pipe collection; Amish Quilt rack; KENT coffee bedroom suit, dbl bed, night stand dresser w/mirror; Electric Gone With the Wind floral painted lamp; No. 12 ovenware pink & blue banded batter bowl; Carnival glass bowl; HALL green batter bowl; pots & pans, iron skillets. All information provided is to be utilized only as a guide. Buyers are responsible to conduct any inspection, inquiry, investigations and due diligence regarding to property. Buyer agrees and understands that the seller makes no warranties or representations of any kind either expressed or implied as to the condition, quality, and merchant ability of fitness for a particular purpose of the real estate or any part thereof and/or serviceability for the same. Buyer is buying property subject to any and all easements, leases, covenants and restrictions. The agreement of auction is solely between buyer & seller. Stanley & Son, Inc. and its agents are exclusive agents of the seller. Any announcements made only by the auctioneer from the podium during the time of auction will take precedence over any previously printed material and/or any other oral statements made or implied. No liability exists regarding the information contained in any printed matter for its accuracy, errors or omissions. Bidding is open, just call out, raise your hand or watch the ring personnel…they will assist you and try to get answers to any questions you may have prior to bidding. Statute of Limitations: Any action or suit of any kind must be commenced within one year from the date when the cause of action or suit occurred or it will be forever barred. The Right of Action or suit will begin to run on the date of breach, damage or injury is sustained & not when the resulting cost, damage, harm or loss is discovered. This Agreement will be exclusively construed & governed in accordance with the laws of the State of Ohio, without regard to its conflict of Laws Principles. The exclusive jurisdiction & venue for any controversy or claim between the parties shall be the State of Ohio, County of Ross, City of Chillicothe, by binding arbitration. Real Estate Terms: $5,000 down at time of sale by cash or check, photo ID; offered free & clear prior to closing on/before Aug. 7, 2011; Taxes are $661.76 per half & prorated to closing, Dale Seif, Atty. (740.947.7232); no buyer contingencies exist; sold in present as-is condition. Property identified as Pike Co. Parcel No. 16-022700.000. Personal Property Terms: Personal Property Terms: Cash or check w/photo ID; sold as-is; payment in full prior to removal.